Here are two quick items highlighting the indomitable spirit of meetings. 1. 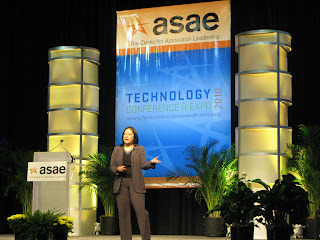 ASAE’s 2010 Technology Conference & Expo (Tech10), canceled when a once-every-25-years snowstorm buried Washington, D.C., last February (thus giving rise to UnTech10, which was a story unto itself), was finally held last week at the Walter E. Washington Convention Center — despite another round of dicey weather. Bisnow has a good roundup of what sounds like a strong program. 2. The American Geophysical Union (AGU) used its 2010 Fall Meeting at the Moscone Center in San Francisco last week to address a life-sciences paper that has drawn vocal criticism for its methods and conclusions since being published in the journal Science at the beginning of the month. AGU added a last-minute panel discussion called “Reporting on Cutting-Edge Science: The Curious Case of ‘Arsenic and Odd Life'” to its schedule of press conferences — the better to consider “the challenges in reporting on controversial research in the era of instant news and the ramifications of conducting follow-up scientific debate in the blogosphere.” Among the panelists was one of the paper’s co-authors. What a great way to leverage a community of resources that was already going to be assembled in one place anyway.